Face it, long distance relationships in high school are hard, especially when the other one in the relationship is an alien. Alex Bianchi may have survived an intergalactic battle, but that still doesn’t excuse her from her senior year of high school, or qualify her for any sort of scholarship. To make up for college tuition costs, she takes a job at a local coffee shop. If only coffee could solve all of her problems. As Alex’s senior year progresses, everything changes and she can’t figure out if it is interstellar or if it is just time to break up with an alien. How to Break Up With an Alien completely blew my expectations of the second book of the My Alien Romance Series out of the ball park! Magan Vernon manages write a fast paced read full of Alex Bianchi charm and of course the good looks of Alex's alien boyfriend, Ace. Alex is home after a summer internship at Circe, daring to juggle both high school and work while overcoming the trials of a long-distance relationship. Before Alex left Arizona she had most of her future planned out: college in Arizona then marry Ace and become a Caltian princess. Doubts begin to arise between Alex and Ace and their relationship hits rough waters. The question, though, is whether these doubts are Alex's or is someone powerful trying to sabotage their relationship? The storytelling in How to Break Up With an Alien gets to the point quicker than in the first book, How to Date an Alien. There's less world building and even though there are a few new characters, the story doesn't focus too much on them. The problem of the story is revealed early on and readers aren't taken round and round in circles for the solution. Alex was a bit slow in realizing that something was not right, because the perpetrator became fairly obvious after a certain point in the novel and she just glossed over the signs. When Alex begins worrying over her future a certain pattern emerges and pretty much points its fingers at the cause of trouble. Alex is academically smart, but sadly, her strength does not lie in deductive reasoning. Alex is a character that has plenty of room for growth. She's not yet at the point where she can firmly stand up for herself, though she seemed to be heading towards that point after facing down the big, bad Caltian queen. I do believe that she's a stronger person when Ace is around and I love that her devotion to him is always a part of her decision-making. I'm sure that after the events in How to Break Up With an Alien Alex has much soul-searching to do, but I can't wait for her next adventure! 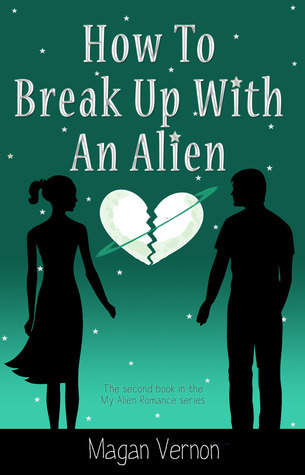 Add HOW TO BREAK UP WITH AN ALIEN on Goodreads. Read my 4 Dove review of How to Date an Alien. This is such a strange concept but it sounds really good!